While obtaining his chiropractic education at the National University of Health Sciences, Dr. John Klimediotis experienced a devastating injury to his elbow from playing basketball. He was completely unable to extend the joint and had to endure six months of pain and dysfunction. He finally consulted with a chiropractor who became an important mentor in his future professional life — Dr. Dan Duffy, Sr., a specialist in Applied Kinesiology. Dr. Duffy was teaching a seminar in Chicago at that time. He invited Dr. John Klimediotis on stage to demonstrate elbow mechanics using Professional Applied Kinesiology. “After only one 20-minute treatment, the pain disappeared, and the joint regained its mobility.” Nineteen years later, Dr. John Klimediotis’ elbow remains problem-free. 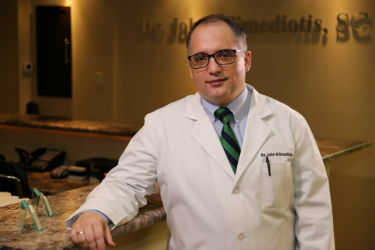 Dr. John Klimediotis is passionate about expanding his knowledge to help his patients recover as quickly as possible from pain, injury or functional issues ranging from autoimmune disorders and allergies to systemic problems related to the kidney, thyroid or digestive tract. Dr. John Klimediotis is married to Maria and the father of five young children. When he is not caring for his patients, he puts all of his energy into his family, enjoying biking, hiking and playing soccer. He also loves to read and further his knowledge of his craft. If you or a loved one are experiencing a health challenge, you can count on our help. We have the tools and expertise to examine your problem and help you find the right solution. We look forward to helping you achieve health and wellness. Contact us today!